After signing a void agreement on “crisis settlement” on Friday, the situation in the Ukraine has rapidly got out of control of its signatories and “witnesses”. No provisions of this document were fulfilled. The legitimate authorities fled (or tried to flee) the country, the governmental buildings in Kiev are taken by the revolutionary mob. The radicals are dictating the new rules to façade opposition “leaders” who desperately try to bridle the Maidan. What happened to the Ukraine on February 21, 2014 is essentially a criminal coup committed by the radical armed anarchists and Ukrainian Nazis who have been enjoying a comprehensive financial, military, diplomatic and even religious support and instigation from the Western power groups for the last two decades. Many of the Ukraine’s cities are now falling into the chaos of lootings, unprovoked violence, lynch law and political repressions. The first signs of upcoming chaos were clearly seen as the Ukrainian authorities wavered at the three-month siege of the centre of Kiev by the radical guerrilla elements from Galicia and local criminal gangs. They watched silently when furious fanatics were burning unarmed riot police Berkut officers alive, lynching them and pulling out their eyes. They did nothing to stop frantic “freedom fighters” from storming regional administrations, humiliating the officials and looting police and military arsenals in the West Ukraine. They were paralyzed when unidentified snipers were cool-bloodily killing militia personnel, protesters and casual passers-by from the roofs of Kiev’s buildings. They even declared amnesty (twice!) to those guilty of the brutal crimes against policemen and public order. Thus Yanukovych’s regime itself paved the way for a sinister ghost of the war-torn Libya to come to Ukraine. Is the guerrilla side a self-organized and self-indoctrinated popular movement tired of a corrupt and inefficient state? That is hardly the case. The products of such indoctrination were not long in coming. A number of NATO-sponsored training centers for the Ukrainian ultranationalist militants were opened on the territory of the Baltic states immediately after they joined NATO in 2004. The detailed photo report on a Ukrainian group taking a course of subversive activities at a NATO training center in Estonia in 2006 is available here (texts in Russian). 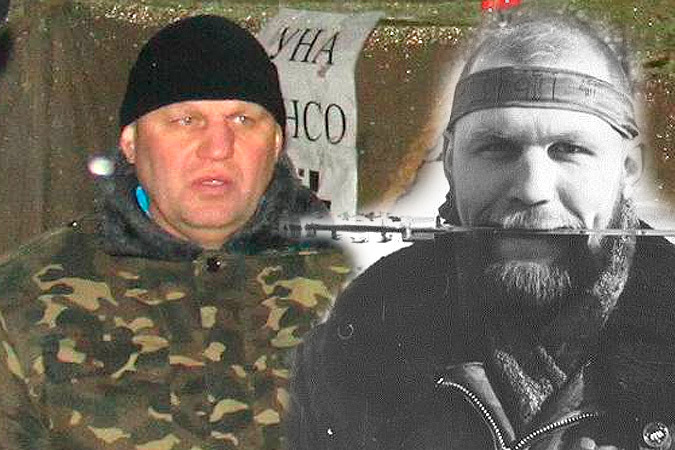 Olexander Muzychko today in Kiev (left) and in Chechnya in 1994.
the ongoing coup d’état in Kiev. According to his “official” biography (link in Russian), in 1994 he was awarded by the then top commander of terrorist Ichkeria enclave Dzhohar Dudayev with the order “Hero of Nation” for “outstanding military successes against Russian troops”. His “military skills” were quite specific: he used to lure the Russian units operating in remote Chechen locations to guerilla ambushes. Then he personally participated in tortures and beheadings of the captured Russian soldiers. After returning to the Ukraine in 1995, he led a criminal gang in Rovno. Eventually he was prosecuted and sentenced for 8 years term for kidnapping for ransom and attempted assassination of a Ukrainian businessman. He entered politics after release from prison in late 2000s. After the end of Chechen and Balkan wars the British and American private military contractors were routinely recruiting Ukrainian mercenaries for operations in Afghanistan, Iraq, Syria and elsewhere. The Britam Defense scandal revealed the way and scale of how the Ukrainian personnel of the private military contractors were used in provocative clandestine actions to meet Western political goals in the Middle East. Many of them were sent to Kiev to make the job they are paid for – to target both policemen and protesters on “Euromaidan” from the roofs of surrounding buildings. The real leaders of the protest have already clearly expressed their radical views to the European press (read e.g. the interview with the Pravyi Sector leader Dmitro Yarosh and several recent Guardian’s publications here and here). That is the sort of people the half-hearted European politicians are about to deal with in the Ukraine. These fanatics are the real authority in today’s Kiev seized by the marauding mobs. They have torn the Friday’s agreement signed by four Ukrainian “leaders” and three European officials before the ink was dry on this paper. Their treatment of Yulia Timoshenko after her emotional speech on the Maidan Saturday night has clearly shown that her nomination de facto head of failing Ukrainian state would be their decision. 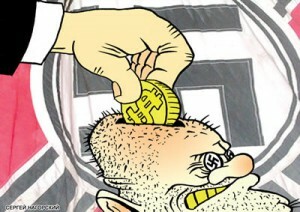 Latest Western advice to financially support the Ukraine with the IMF and the EU funds suggest that they have chosen to buy the loyalty of the ultranationalists for the transition period. Therefore, the ongoing Western policy of appeasement towards the radical insurgents in Kiev very much resembles the Anglo-American connivance in Hitler’s accession to power in Germany in 1933 and the rise of the Third Reich. But if the Western elitist groups suppose that the Neo-Nazi project that they have carefully cherished and supported in the Ukraine for decades, would be controlled by political means and set against Russia, they are deadly wrong. After facing furious resistance and blowback at the East and South of the Ukraine, the radical Nazi ideological avalanche encouraged by the illusion of success in Kiev would inevitably enter the degrading European political landscape where the neo-Nazi and hooligan outbreaks are already a notable destabilizing factor. Their established links with the Islamist underground in Europe add another sinister dimension to the murky European future. Is it the price the Europeans are ready to pay for bringing its eastern neighbors into the “family of civilized nations”? Does Venezuelan Television Provide Coverage That Opposes the Government?